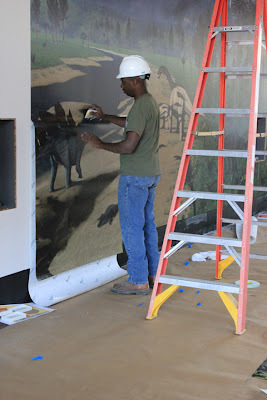 The completion of the Quarry Visitor Center rehabilitation and reconstruction project poses a conundrum for the Quarry Visitor Center blog. 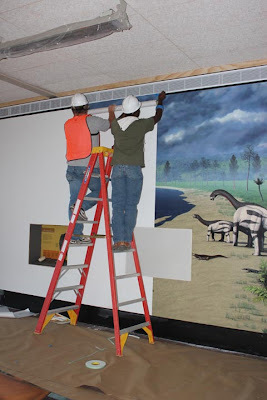 I started this blog in March 2010 with the purpose of documenting the scientific and resource management implications of a unique undertaking --- the partial demolition and reconstruction of a building over a large, in-place exhibit of dinosaur bones. With that project completed I could bid adieu and we could all go our own ways. Although there are still paleo things to blog about at Dinosaur they have little or nothing to do with the QVC project. 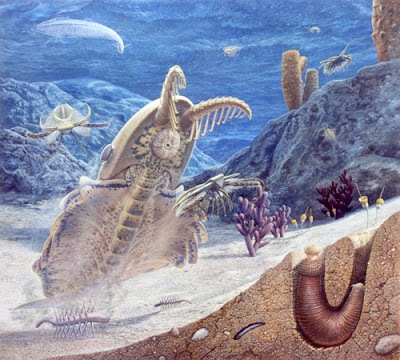 Paleontology itself is an amazingly active field, with new and astounding discoveries happening all the time, and a rich, complex, and sometimes very peculiar history. So there is much to still be blogged about. With that in mind, I’ve decided to continue, with a few modifications. I’ve changed the title to one that better encompasses what I’ll be blogging about, essentially anything paleontological and not just dinosaurs. In keeping with that change I’ve also changed the format. However, the url is the same, which means that all my past posts are still available here, though the blog name is different. So those of you who have been following me can continue to do so without having to sign on to another site. 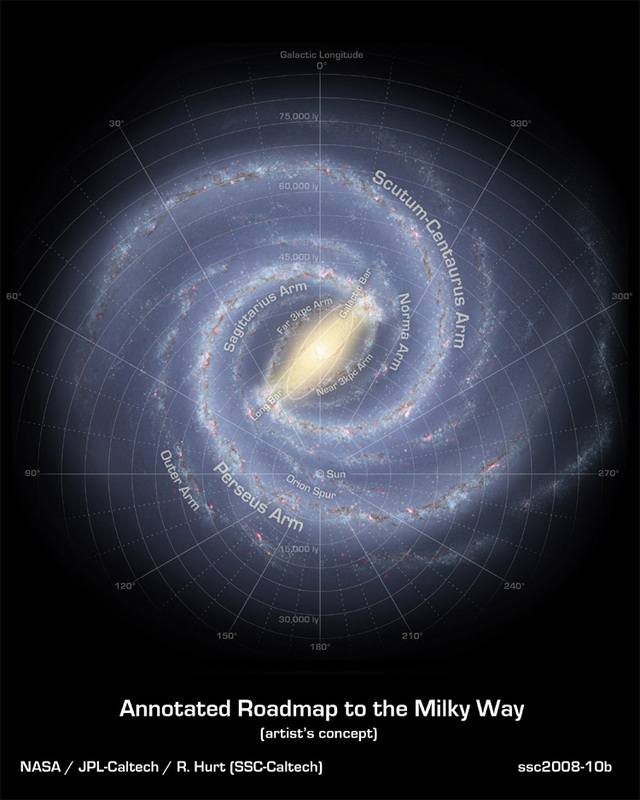 I hope you’ll enjoy the larger universe of the new blog and will follow along. Please put seat backs and tray tables up, fasten your seat belt, and enjoy your trip to the Land of the Dead. 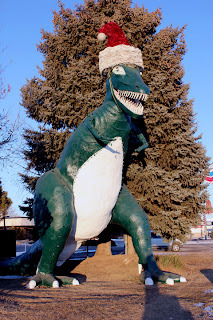 Five minutes sooner and I would have gotten a photo before T. rex got to all the reindeer! This is something of an administrative Charybdis and Scylla. It is no secret that the NPS worries about “losing relevance” to most Americans in the 21st century and is making great efforts to attract visitors to its nearly 400 units. At the same time, there is the oft repeated NPS lament that visitor impacts are so great that parks are being “loved to death.” So balancing resource protection and visitor enjoyment can, at times, be quite difficult and challenging. 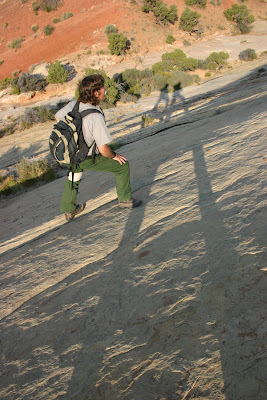 In the previous post I looked at the travails of early visitors trying to get to the Monument. Now let’s look at that visitation from the perspective of impacts. This is an particularly interesting observation, because the phrase “even our own people” implicates NPS and other government officials visiting Dinosaur in the illegal taking of dinosaur bone trophies! 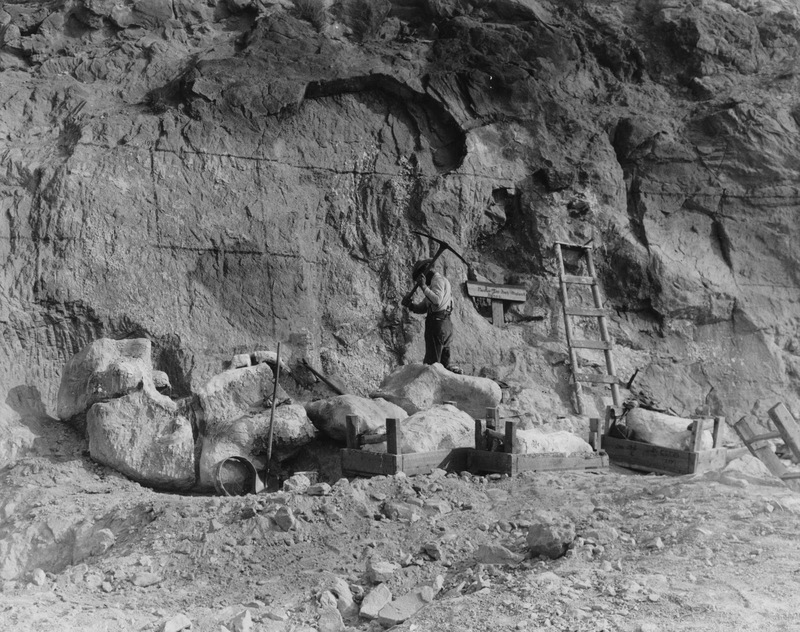 That souvenir taking was a serious problem early in the Quarry’s history is evidenced by this old photo. 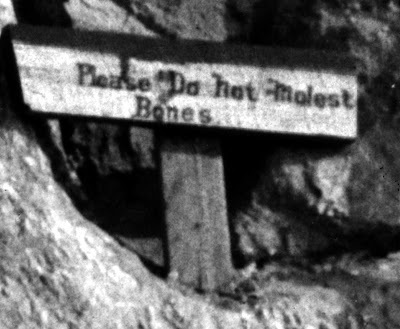 The problem of fossil theft became so severe that David Madsen recommended that site Supervisor A.C. Boyle post signs prohibiting the taking of any natural specimens and that he should “refrain from taking parties to places where they will be able to remove specimens without being detected.” (1) The latter is significant because Boyle, as recounted in the my last and previous posts, was energetic and enthusiastic, in showing visitors the fossils and explaining the work underway at the Quarry. Old trophies still occasionally pop up. In the late 1980s the Monument received an anonymously mailed package with a small piece of dinosaur bone and a note stating that the souvenir had been taken by the writer’s grandfather during a visit to the Monument in the 1930s. Now in his later years the grandfather had been feeling sorry for taking it and was sending it back with an apology. Nor is this a problem unique to Dinosaur. Years ago, I saw an exhibit case at Petrified Forest National Park that contained small pieces of fossil wood that had been stolen and then returned with a number of letters of apology. 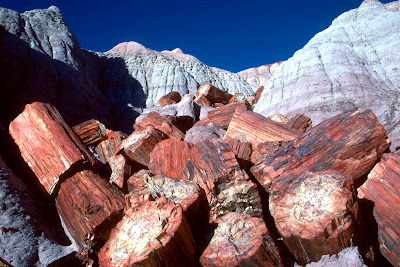 The letter I remembered best was from a self-described “good Christian man” who recounted that he had found the pilfered petrified wood in his wife’s bra. I read the letter carefully for clues as to the circumstances under which this discovery was made, but no details were forthcoming. One is simply left to wonder and speculate. Nor is it a problem unique to fossils. Haleakala National Park in Hawaii is well known for people mailing back souvenir pieces of lava illegally taken from the park. Some lament their bad fortune after stealing the lava --- jobs lost, illness, even death of loved ones. I feel sorry for someone who feels responsible for their child’s illness because they stole a small piece of lava. Then again, if their child hadn’t become sick they would probably have kept the lava in a kitchen drawer until someday someone asked “What is this piece of junk?” and then chucked it into a garbage can. The garbage dump is the final resting place for many such “priceless souvenirs”, be they rocks or fossils. 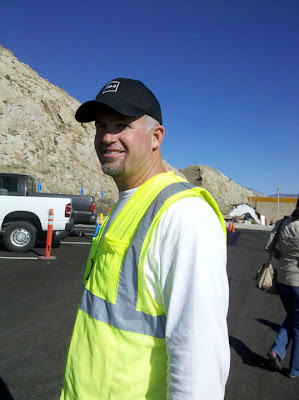 For the last 18 months I have been your on-the-spot cub reporter for the construction project at Dinosaur. 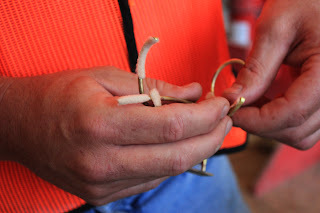 But in truth I am just a lowly vertebrate paleontologist with little construction experience. 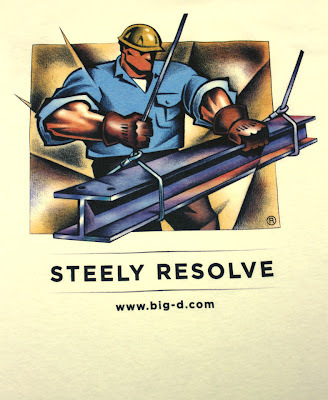 I did build an awesome backyard skateboarding park, including quarterpipes, flyboxes, ramps, rails, and a really big halfpipe --- quite an accomplishment for me, but hardly real construction. Yes, I made a small contribution as a member of the large team involved in the concept development and design of the building. However, like Blanche Dubois, I depended on the “kindness of strangers” to understand the details of the actual construction project and how it was carried out. 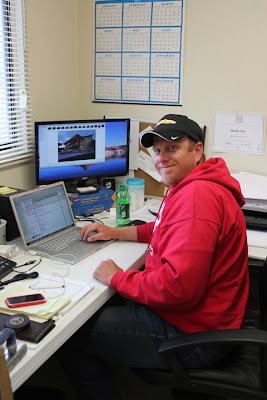 So I need to give a special thanks to three guys who were in-charge and on-site for the entire project, Dan Cox (Advanced Solutions Group), Steve Elkins (Big-D Construction) and Justin Jones (Atkins). Even though their days were incredibly busy with overseeing and managing the project, these gentlemen were always cheery, willing to answer my questions, and took time to explain what part of the project was underway and its unique problems and challenges. They were kind enough not to laugh out loud as I referred to a piece of construction equipment alternatively as a GJL, LJG, and JGL. I’m still not sure which is the correct acronym. Then again, they can’t tell the difference between the posterior cervical vertebrae of Brachiosaurus, Camarasaurus, and Apatosaurus. So the Universe remains in balance. 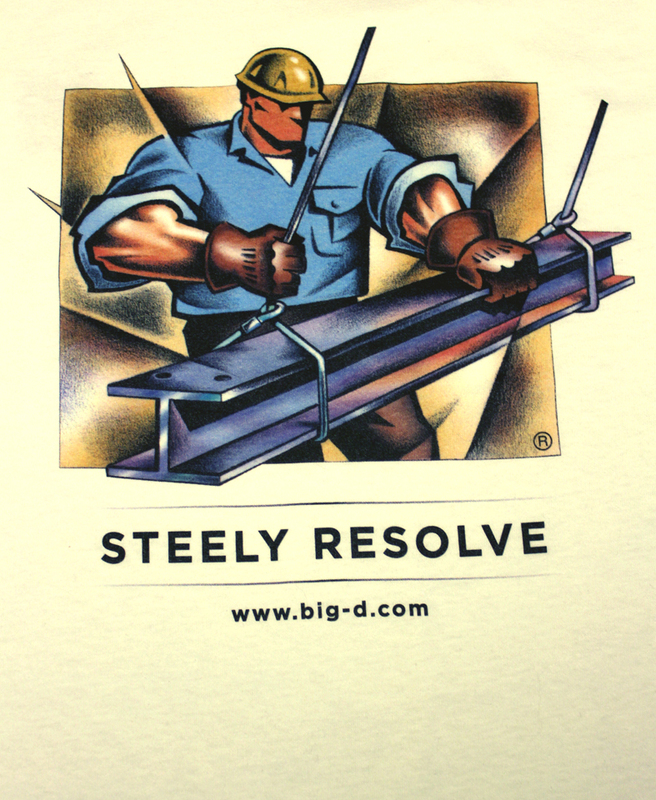 Dan, Steve, and Justin have all moved on to supervising other construction projects now and I wish them the best. However, constant reader, we have more to paleontology to explore, so stayed tuned. 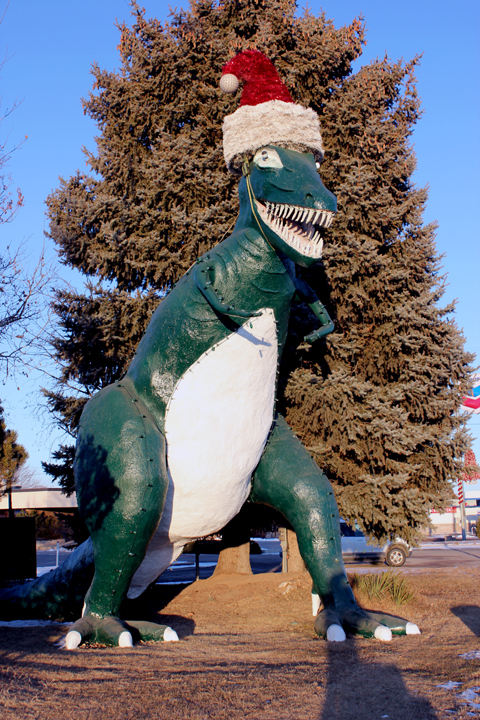 … understandable to the general visiting public coming to Dinosaur to learn about dinosaurs and the world they lived in? 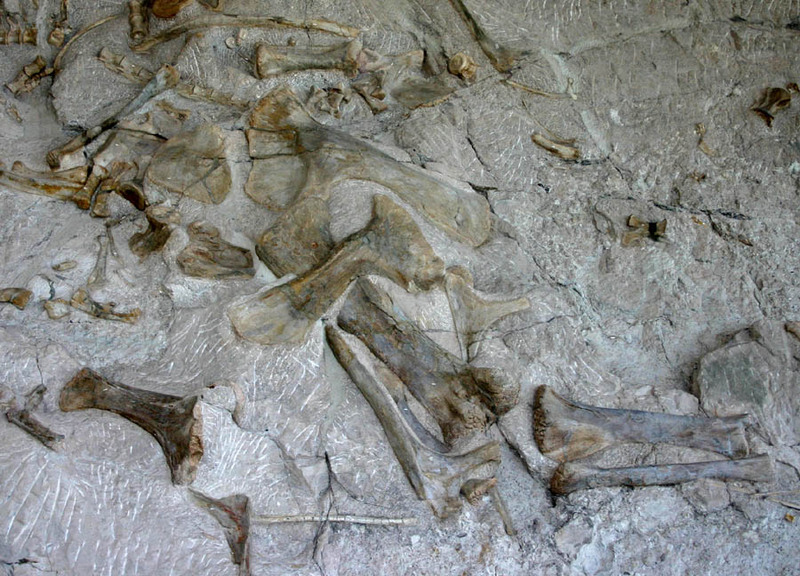 Much of the science of vertebrate paleontology involves detailed morphological description of bones and analysis of evolutionary relationships (the latter assisted by sophisticated computer programs evaluating extensive morphological/taxonomic databases). Inferences about paleobiology can only be based on an understanding of morphology and how the components of an organism function as an integrated whole. 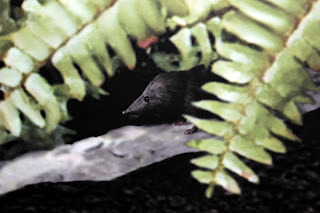 So while a visitor may not understand, or even care about, the fact that Glirodon has restricted enamel on its incisors, they might be interested in what this means --- that these ancient diminutive mammals had self-sharpening teeth, as in rodents (even though they have only a very remote relationship to rodents) and could gnaw on resistant plant material without dulling them. And Glirodon, whose skull is only a one inch long, is known only from the Morrison exposures in Dinosaur and nowhere else. 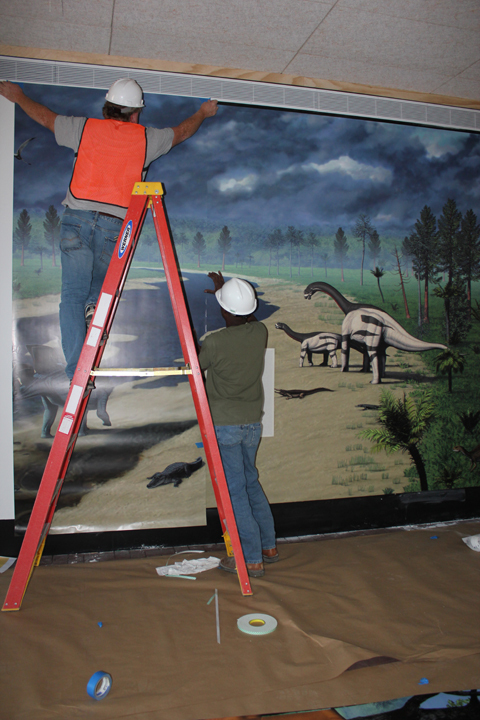 At Dinosaur we are faced with the further problem of having relatively little exhibit space in the Quarry Exhibit Hall. Filling that limited space up with dense text and complex illustrations of teeth and bones might get the message across to our colleagues but would tend to cause visitors’ eyes to glaze over, especially so with kids. This is further complicated by the fact that the Morrison Formation in the Monument has an exceptionally rich and diverse fossil record ranging from 80 foot dinosaurs to microscopic pollen. So to solve this problem making the scientific mumbo jumbo understandable we turned to the community of paleoartists who specialize in bringing the past back to life. For our new exhibits we worked with Bob Walters, Tess Kissinger, and their talented staff who have extensive experience in this area, including creating the largest ever mural of a dinosaur community (check out http://www.dinoart.com/ for many examples of their artistry). They have won several prestigious awards for their work. 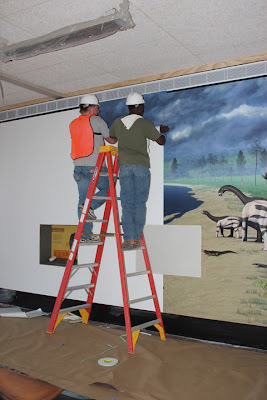 I worked very closely with them in developing the major art piece for the QEH --- an 80 foot long, 9 foot tall , full color reconstruction of the Morrison ecosystem preserved in the rocks of Monument. We decided quite early in the process to try and show as much of the Monument’s Morrison diversity as possible. That was no mean feat given that over 60 species have been found here and most of the diversity is small non-dinosaurian animals, some microscopic. It was quite a challenge and an exciting experience. I’ll talk about the mural in the future. For now I’d like to explain how one installs such a monumental piece of art. In a way it’s just like hanging wall paper, sort of. 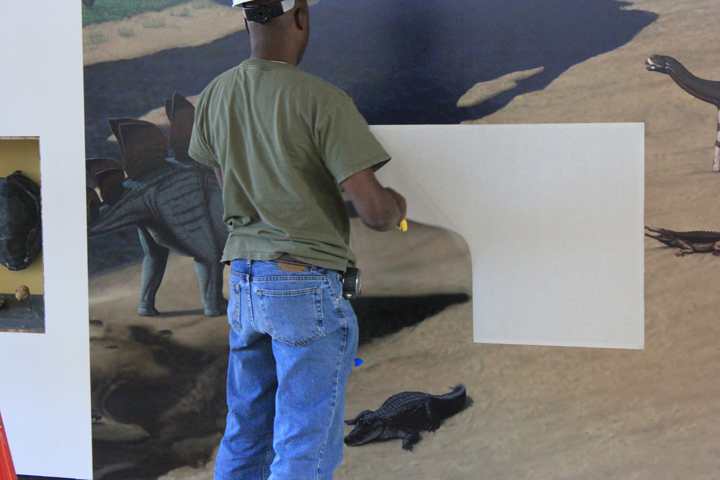 The entire mural is printed across numerous sheets and in one run. 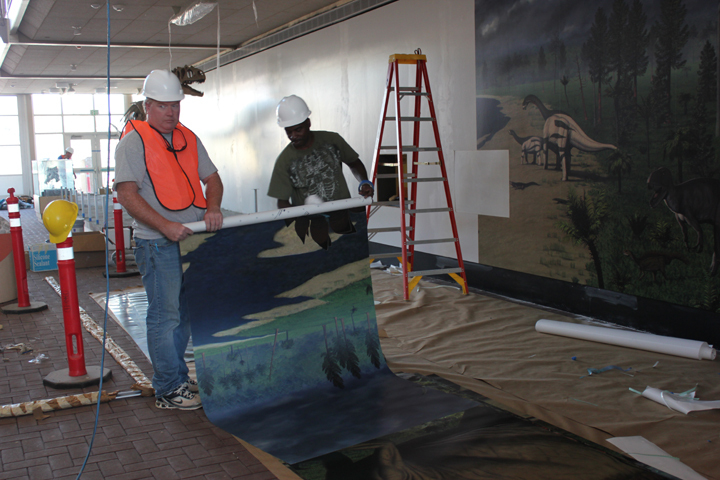 What that means is that if one sheet is somehow damaged or ruined the entire 80 foot mural needs to be reprinted and rehung. One cannot simply print a single sheet because the colors will be ever so slightly different and it will stand out oddly in the mural. So it’s like hanging wall paper except if something goes wrong the entire thing needs to be redone. I hate hanging wallpaper even more than I hate accordion music. 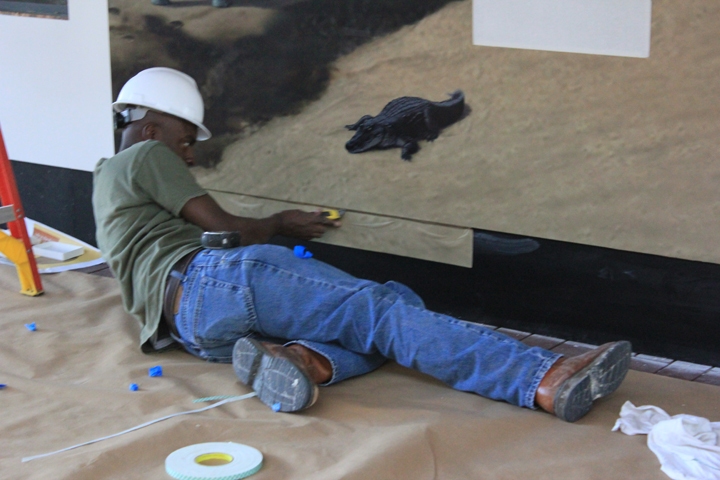 Luckily, the exhibit installers had considerable experience with this sort of thing. So let’s follow how this is done. First a new 80 foot x 10 foot wall is installed that is flat and has smooth seams, with no gaps between sheets of drywall. 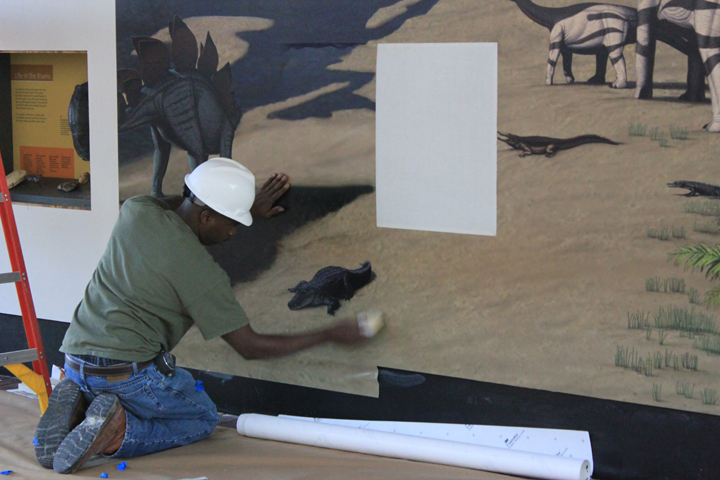 … and lined up with the top of the mural and the previously hung sheet. The backing is removed near the top and the sheet attached. 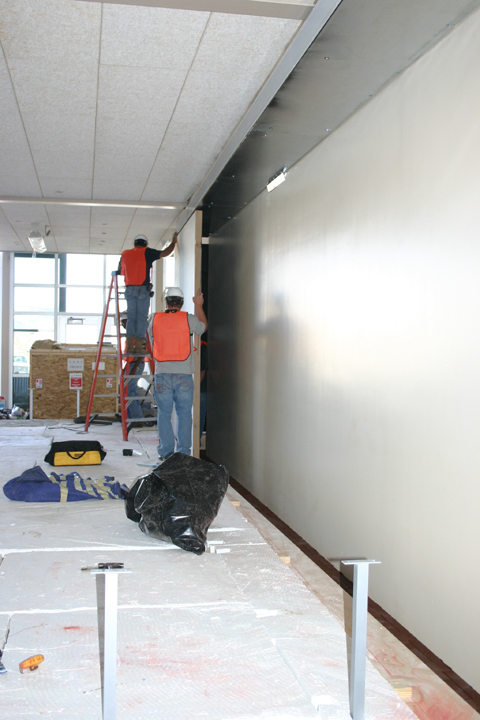 Then the backing in removed in sections and the entire sheet is placed on the wall. 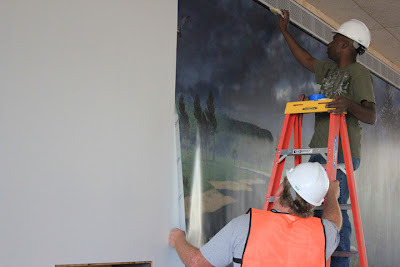 Wrinkles are a potential problem, so as the backing is removed the mural is rubbed with a soft but somewhat stiff block to make it smooth. The excess at the bottom is trimmed off. There are exhibit cases set into the mural so the parts of the mural over those cases is cut away. When the sheet is done, repeat process until all 80 feet of the mural is installed. 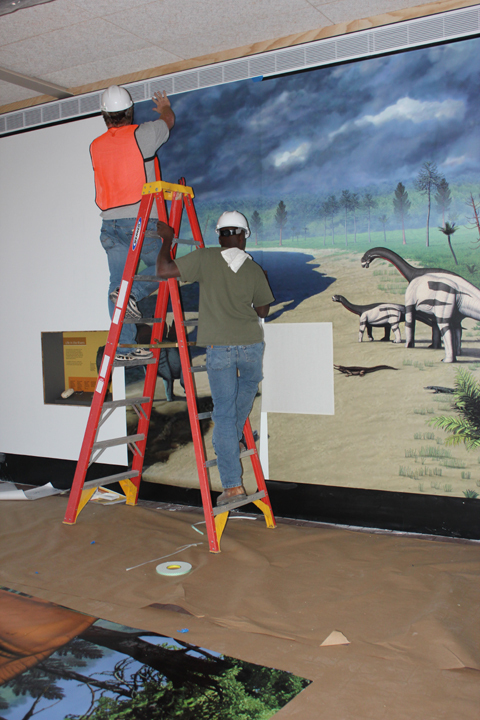 The mural is both a striking piece of art and a scientific tool of great explanatory power. Remember, much of the Morrison’s diversity is small and finding some of the animals in the mural is akin to a 149 million year old Where’s Waldo? (1) Engelmann, G.F. and Callison, G. 1999. Glirodon grandis, a new multituberculate mammal from the Upper Jurassic Morrison Formation. in: Gillette, D.D. (ed.) Vertebrate Paleontology in Utah. Utah Geological Survey, Miscellaneous Publication 99-1: 162-177. The exhibiting of fossil vertebrates at Dinosaur is somewhat unusual in that in our main display the 1500+ in-situ bones are supported by the conglomeratic sandstone in which they were buried. 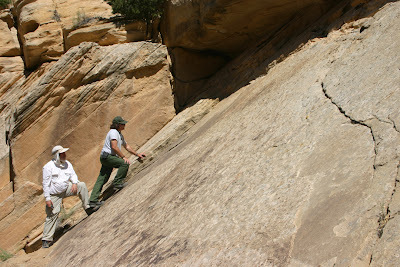 Although a few areas are friable from increased clay content, much of the sandstone is both hard and strong, which allows bones weighing up to several hundred pounds to be safely exposed in bas-relief. However, delicate items, even if still in small pieces of rock, present a different challenge. 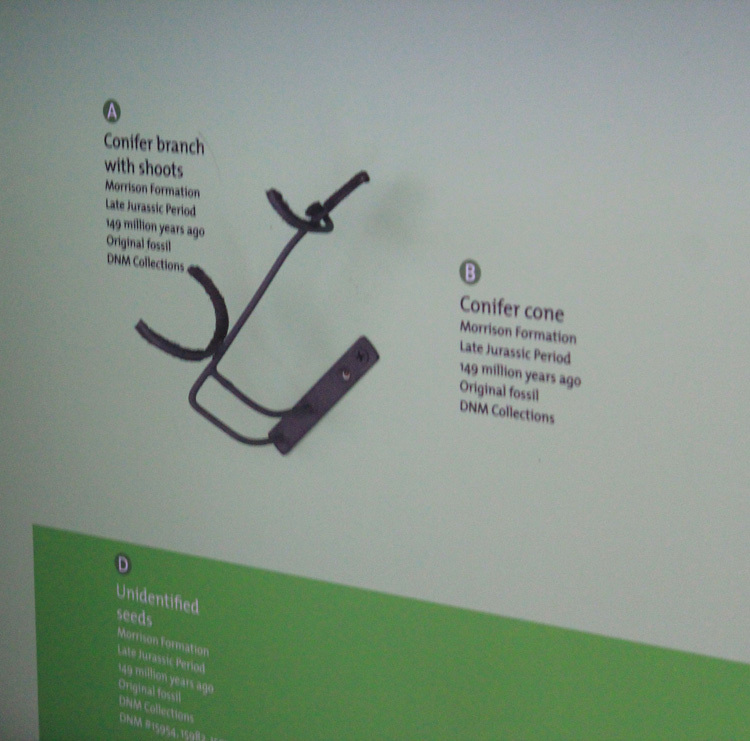 These are displayed in cases and require other support so that they are held securely and in the right place both relative to lighting and explanatory text. These supports are built on site by the exhibit fabricators and installers. Each is built to match the specific size and shape of the fossil it holds. The fabricators start with a collection of brass rods of varying width, length, and shape. In most cases, four arms are needed, so short pieces of brass rod are cut and laid across one another at right angles. These are placed on a heat resistant ceramic slab. 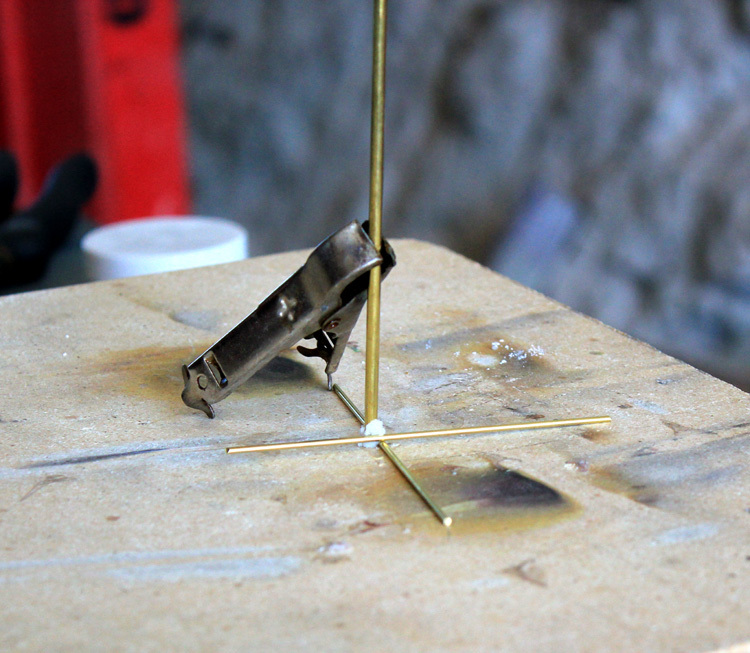 Next, a rod is placed vertically and supported upright with a clamp. 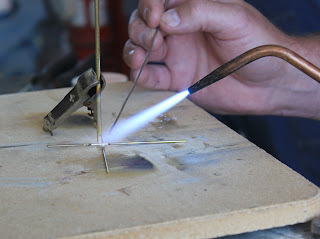 A small dab of flux is placed at the point where all three rods contact. Now you can see clear why a ceramic base is needed. A small butane torch and solder is used to firmly join all the pieces together. 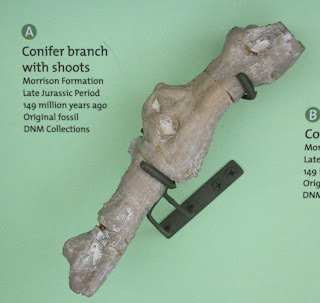 The arms that hold the specimen are cut to the correct length and bent to fit around the edges of the fossil. Areas that will directly contact the specimen are cushioned with soft white material or a rubber sleeve. 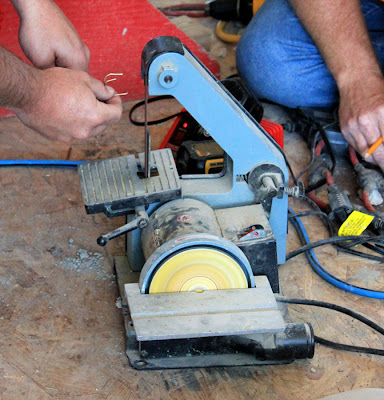 Once properly formed, the ends are rounded off on a small belt sander. Then the frame is put in a vise and spray painted a neutral color. 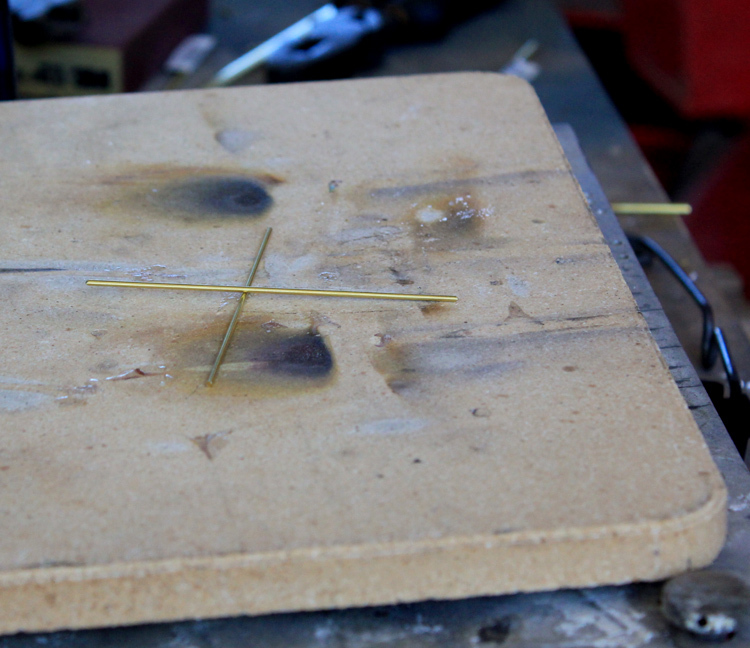 … and the specimen is placed in it. 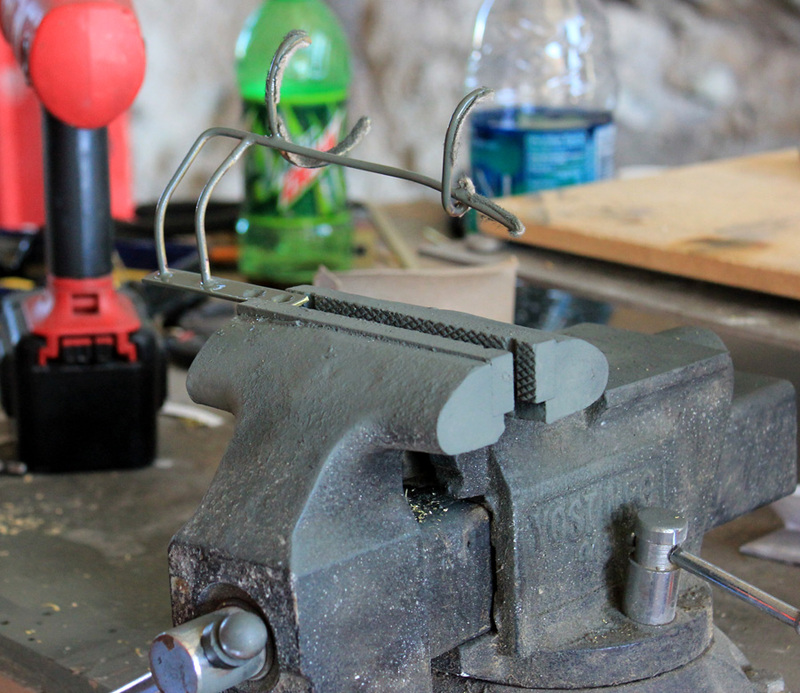 The small arms are adjusted as needed so that the fossil is firmly held. 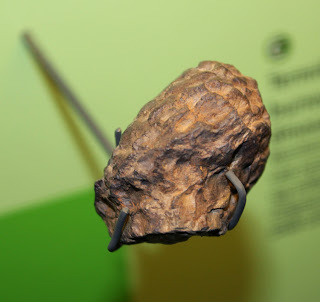 In this example, the fossil is part of a three dimensionally preserved piece of conifer branch from rocks the same age as the Carnegie Quarry but found a short distance away from it. 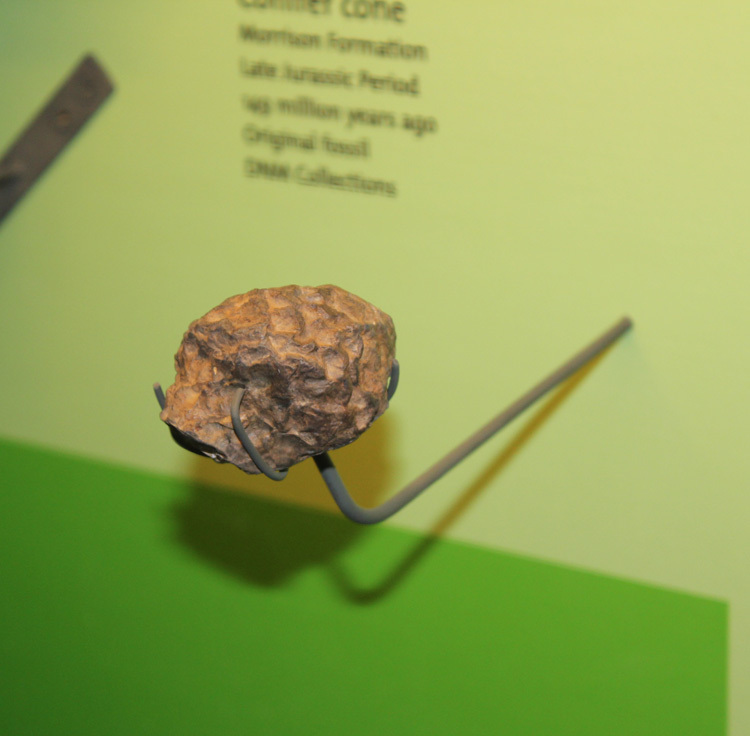 Another example is this cast of a fossil conifer cone held further forward in the case than the conifer branch. Virtually all the smaller fossils exhibited at both the Quarry Visitor Center and Quarry Exhibit Hall are on mounts such as these. Such delicate mounts require skill and patience and, if done well, are not really noticed by the viewer. So next time you wander the hall of a museum take a moment to look beyond the specimen and notice how the object is supported and positioned. Its an important, if often overlooked, part of the exhibit. The Organic Act of 1916 established the National Park Service and in that piece of legislation the mission of the NPS was laid out: "...to promote and regulate the use of the...national parks...which purpose is to conserve the scenery and the natural and historic objects and the wild life therein and to provide for the enjoyment of the same in such manner and by such means as will leave them unimpaired for the enjoyment of future generations." These words are the ruler by which we, as an Agency, measure our actions and direct our programs (most of the time). 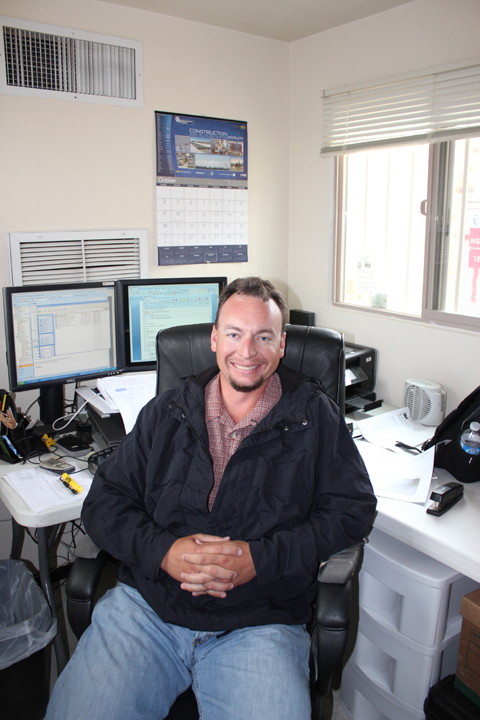 Nearly all our employees love the mission and most love both the mission and the organization. I do suspect that there are a few miscreant employees squirreled away who like neither. 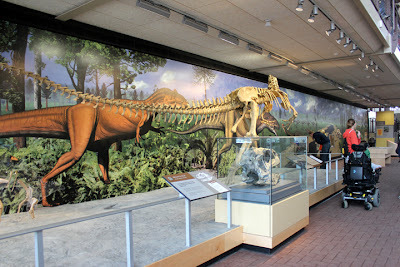 Dinosaur National Monument was established in 1915 to preserve and protect dinosaur remains, making the Carnegie Quarry the specific site for which the Monument was created. 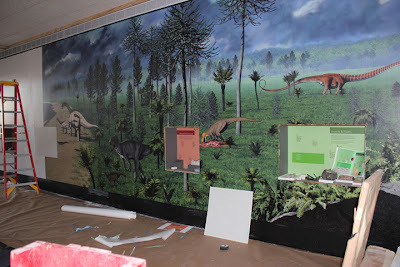 Thus the QEH project to make a more stable building is crucial to Dinosaur meeting it mission. With the completion of the project we now have a building that will protect the fossil deposit far into the future. However, “… unimpaired for the enjoyment of future generations” means different things to different people and depends on your frame of reference. Einstein, in his laws of relativity, made it clear that there is no universal frame of reference and one must stipulate what the frame of reference is for any given measurement or observation. So let’s look at the fate of the NPS mission for the QEH and Carnegie Quarry from a perspective other than that of "future generation"... oh, say the frame of reference of Earth History. 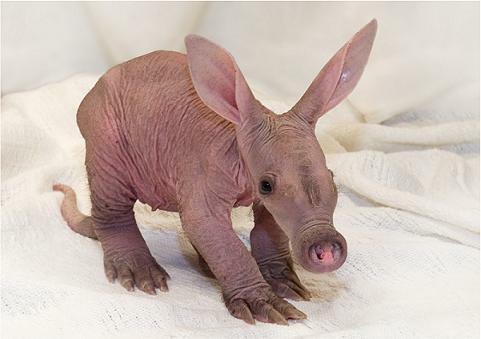 …… you would not predict that over the next several hundred million years these groups would diversify into tyrannosaurs, whales, tree frogs, aardvarks, rhinos, stegosaurs, dragonflies, bracket fungi, Venus fly traps, and so forth. Your failure would not be one of lack of imagination. Rather, it has to do with the nucleic acids that make up our chromosomes and genes. The mere process of replication of hereditary material during cell growth and division creates new genetic combinations and arrangements. Individual genes mutate, offering additional genetic diversity. Once sexual reproduction evolved, the process of meiosis that produces gametes and the fertilization of eggs by sperm vastly increased genetic diversity. Every progeny is, in a sense, a roll of the dice with different genetic composition upon which natural selection can work. 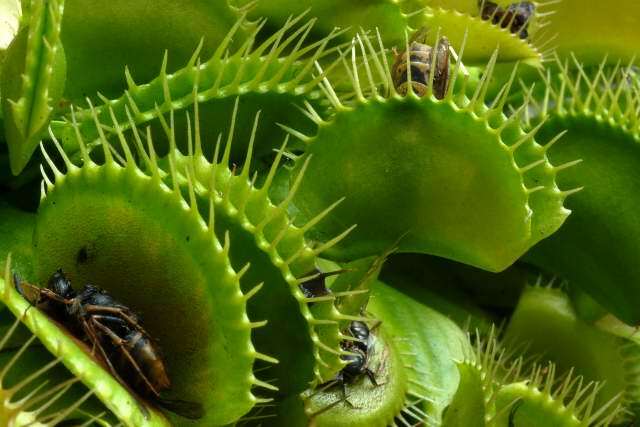 Given all these sources of variation and the various ways that natural selection can cause differential survival in any generation, one simply cannot make long term predictions about how a lineage of organisms will evolve or even if it will survive, or go extinct. There are few “natural laws” of broad application in biological systems. In contrast to living systems, physical systems are more subject to forces that can be determined, quantified, and used to make predictions. That is why one can predict the trajectory of munitions, the orbital path of a moon, planet, solar system, or galaxy with some precision. In general, laws ruling the physical world are more common than those in biological systems and have more predictive power. “Yes, yes” you say, “how very interesting and clever. You’re a regular geological Noel Coward. But what the hell, may I politely ask, does this have to do with the QEH and the mission of the NPS?” Well let’s have a look. By way of starting, let’s look at our location. 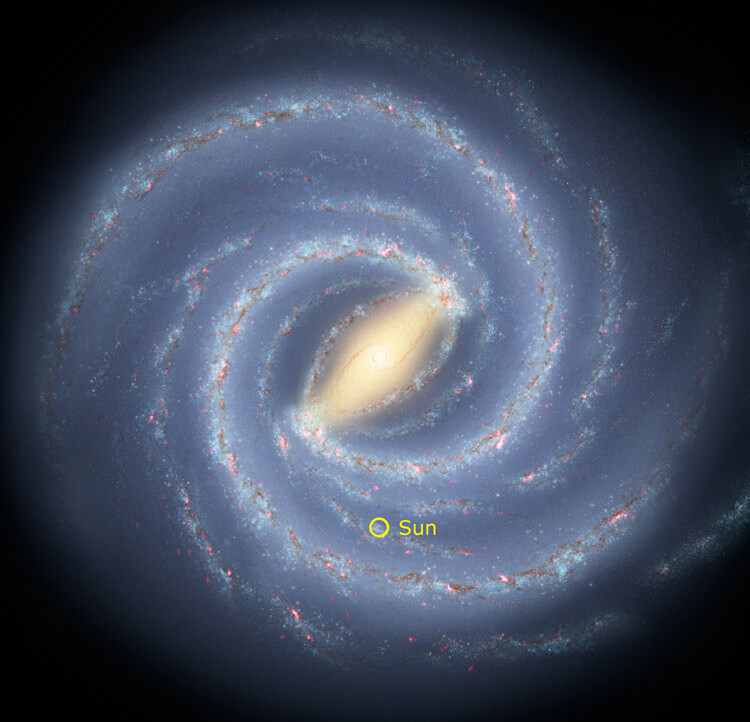 Our solar system sits on the Sagittarius arm of the Milky Way Galaxy of the local cluster, about half way out from the galactic center. Now that we are oriented, what lies ahead? In the following, all years are years in the future. 100 million years Based on what we know of the history and pattern of meteorite, comet, and asteroid impacts of Earth and the solar system, by this time Earth will be have been struck by an extraterrestrial object of the size that killed the dinosaurs and caused the Cretaceous global extinction event. 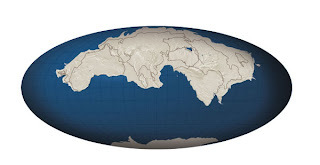 250 million years Following current patterns of plate tectonics and continental drift, nearly all the continents on Earth fuse into a new supercontinent, completing the latest supercontinent cycle. 600 million years The increasing surface temperature of the Sun causes increased weathering of rocks on Earth, resulting in decreasing atmospheric levels of carbon dioxide. 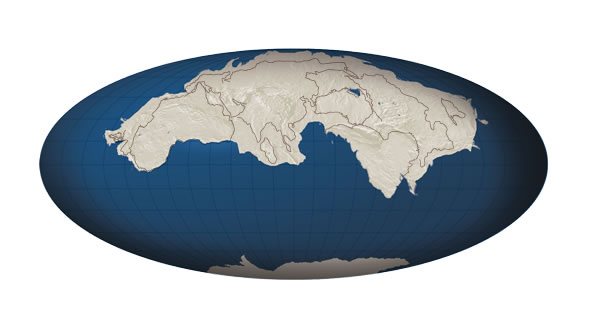 At 600 millions years these levels will be so low that C3 photosynthesis in plants will become impossible. Since approximately 99% of the living plants species use the C3 photosynthetic pathway, the result of these changes will be a catastrophic plant extinction. 800 million years Decreasing levels of atmospheric carbon dioxide drop to levels where C4 photosynthesis is no longer possible, resulting in the extinction of all plants that avoided the 600 million year extinction event. Since plants produce oxygen as a by product of photosynthesis, atmospheric free oxygen will eventually disappear. 1 billion years. The luminosity of the Sun (i.e. the amount of light emitted) increases by about 10% every billion years. As a result the surface temperature of the Earth by this time will increase to 47oC (117oF) and all surface water, including the oceans, will begin to boil away. 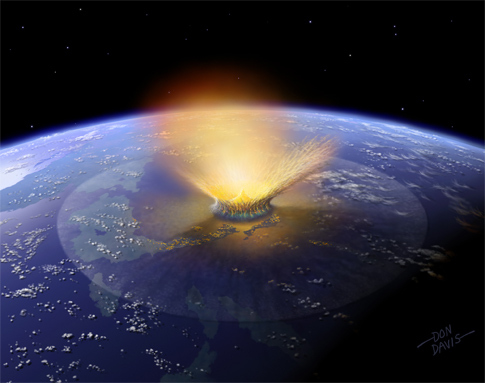 All terrestrial life will become extinct. 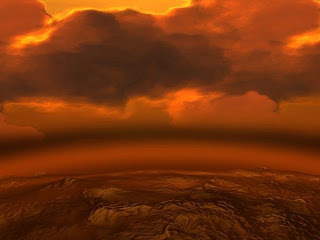 3.5 billion years Earth has become a run away greenhouse and its surface conditions will resemble those of present day Venus with a temperature of 460°C (860°F). 5 billion years Driven by the laws of physics, astronomers can predict the “life history” of a star based on the star’s original mass. It is a widespread misconception that every star will become a supernova and explode. Not true. 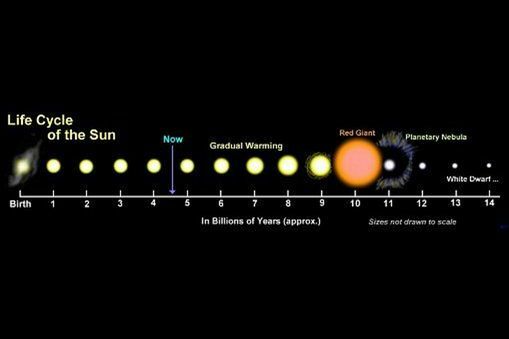 Our Sun is only 1/6 the mass needed to become a supernova and such is definitely not in its future. However, that turns out to be of little consolation. When the hydrogen fuel in the Sun’s core is consumed, the core contracts and heats up. Eventually the Sun will begin to expand and enters its red giant phase. As the size of the Sun grows, it will expand beyond the orbit of Mercury and Venus and both those planets will be consumed. What happens to the Earth is a little less clear because our orbit is in the area of maximum expansion of the red giant Sun. However, even if the Earth is not consumed by the Sun, Earth’s temperature will become so great that our planet’s surface will melt. 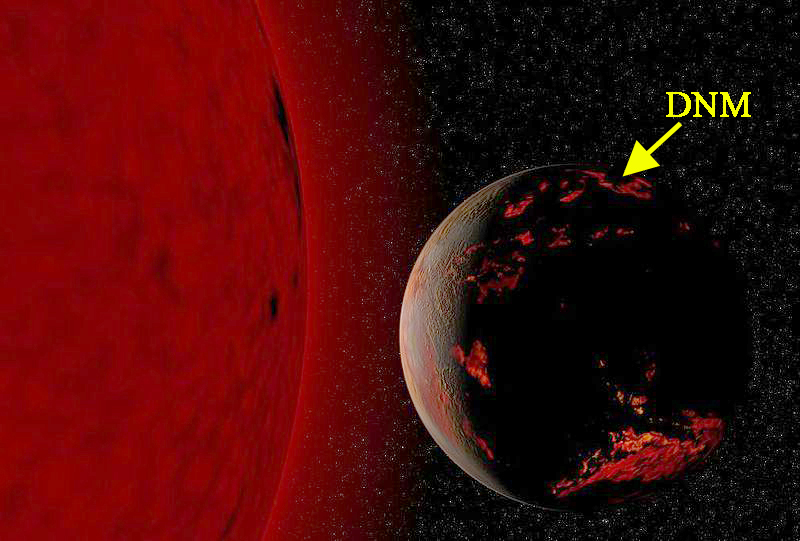 This one is a bit longer but nicely shows the internal evolution of the Sun that results in it becoming a red giant. 7 billion years Our Milky Way galaxy collides with the Andromeda galaxy. Such galactic collisions are not unusual and our galaxy is currently colliding with two dwarf galaxies. 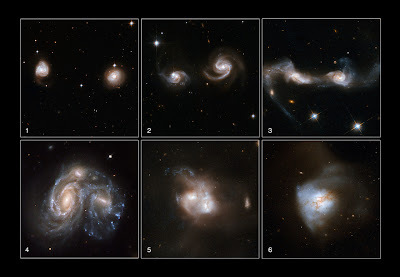 The implications for Earth of a collision with the Andromeda galaxy are uncertain, but photos taken by the Hubble telescope show that galactic collisions are usually nasty affairs. 7.5 billion years After the Sun throws off its outer layers at the end of its Red Giant phase and with only the hot core is left it becomes a white dwarf. White dwarfs are extremely dense, with the mass of the Sun in the volume of our Earth. However, its light comes just from stored thermal energy rather than fusion and it will ultimately cool further with time. Our Sun will become nothing more than a faint spot of light, a mere shadow of its former self. So THIS is the future of the Carnegie Quarry and the Quarry Exhibit Hall. While there are different timelines for these events, the ultimate fate our our Sun, and hence the Carnegie Quarry, is unavoidable. Our Sun’s future is typical of that of low to medium mass stars. And don’t think about running to Mars during the Red Giant stage, because while Mars will warm up and its ice will melt, it will continue warming and become uninhabitable. Both Jupiter and Saturn are gas giants, with only small rocky cores and will never become habitable even if much of their immense, thick atmospheres are lost. It’s possible that some of the moons of Jupiter might have a remote chance of becoming habitable during the red giant stage but that’s unlikely. 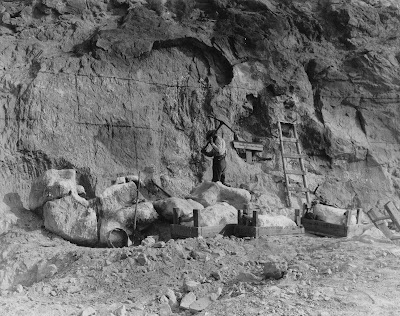 But even if that was so, and even is we could move to those moons, I doubt that we have the wherewithal to cut up the Carnegie Quarry sandstone and bones and haul it with us. 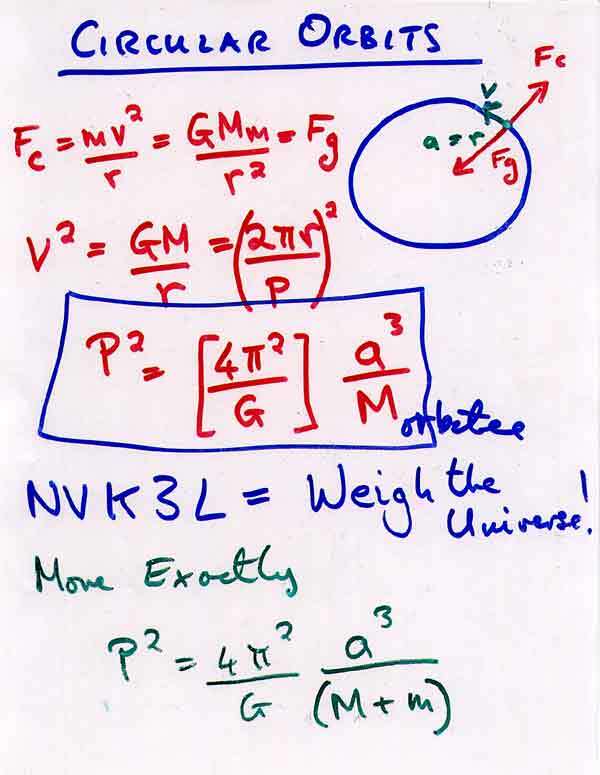 By the way, forget about black hole generated wormholes as ways of jumping to distant parts of the galaxy. 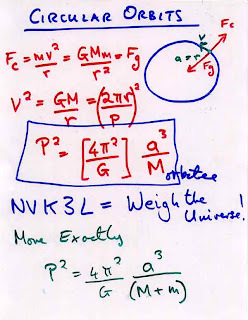 It seems that even if one could manage to successfully navigate through a wormhole, what would come out the other side would retain your mass and momentum but not in any form like that when you went in. When I point this out this future history of the Carnegie Quarry to dedicated NPS employees, virtually all of them express the view of so what, humans won’t be around even a thousand years in the future, much less the amounts of time we are talking about here. I hold the same view but, as I wrote above, predicting what biological organisms and systems will do is difficult, so we don’t know for sure. However, the future history of our planet in inevitable and inescapable. As Darwin wrote in the opening sentence of the last paragraph of The Origin of Species “There is grandeur in this view of life….” and I quite agree --- even as it applies to our solar system’s demise. I only have a decade or two left to wander on the third rock from the Sun and yet I’ve spent a bit of time over the last few years to ensure, even knowing the ultimate outcome, that the new buildings and exhibits will function and protect the wall of bones. While the fate of the Carnegie Quarry maybe of no importance to the Universe, it should be of importance to us. I assume that you, constant reader, agree. Otherwise why would you have followed me over the last 100+ postings here?